They say it's made like a gun, but goes like the stuff that comes out of it. 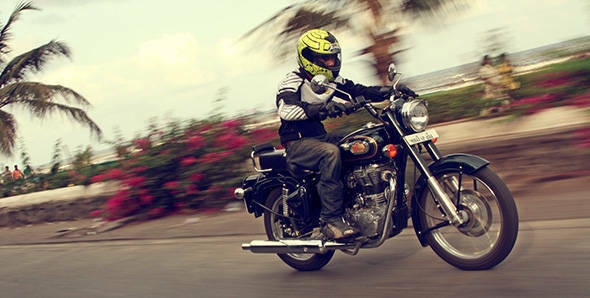 It is India's own world renowned classic motorcycle. Earlier it was only available in black. But now it is also available in Forest Green. Some call it Royal Enfield. Most of us grew up calling it a Bullet. Now though, there's a new Bullet in town. And instead of the 346cc motor, it is powered by a new 499cc unit construction engine. For the uninitiated, the UCE engine was Royal Enfield's big step into the future. It signified the end of the cast iron engine with its separate gearbox. It used a gearbox that was integrated into the engine as a single unit and with the conventional left side gearshifter. The new Bullet 500 uses the same engine that has previously seen use on the Classic 500. It is completely identical except for the fueling. 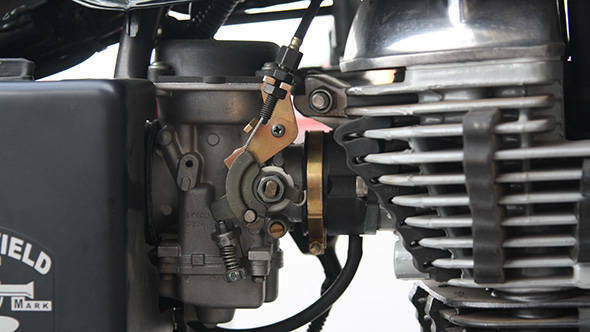 Where the Classic used electronic fuel injection, the Bullet uses a 33mm carburetor with a throttle position sensor (TPS). The TPS helps advance the ignition timing at higher rpms, hence increasing power by ensuring complete combustion. Take a look at the specs and you will notice that the power and torque has dropped a bit to 26.1PS at 5100rpm (27.2PS at 5250rpm for the Classic) and 40.9Nm at 3800rpm (41.3Nm at 4000rpm). You will also notice that the power and torque comes in a tad bit earlier than before. In real life the drop in power does not seem too big. The motorcycle still feels as torquey as the Classic. Even from standstill, there is enough torque to make for brisk progress. However, the engine does feel a bit more vibey low down. Mid-range is where the engine feels happiest. Rev it too little and there is knocking. Rev it too high and there is just noise, no power. But that is not to say that it is a slow motorcycle. In our preliminary tests we saw speeds upwards of 118kmph on the speedo. 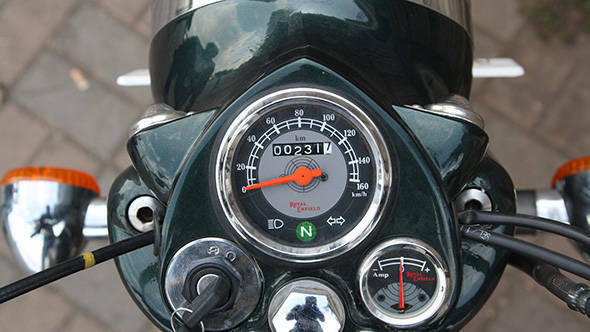 Fuel efficiency in the city also stands at 32.31kmpl which is a little lower than the Classic and the TB500. Where this bike does score is riding comfort. Compared to the most recent Royal Enfield that we rode, the seating is less confused. However we did feel that the Bullet was a hard sprung for a comfortable city bike. Visually, the bike still stays true to the old Bullet. It still has the handpainted pinstripes on the tank. It still has the "tiger eyes". And it still uses the same coke bottle seat. What it does get, though, is a small back rest for the pillion. But at Rs 1.54 lakh (onroad-Delhi) it is quite an expensive old, I mean new bike. But then again, I guess the people who buy Enfields are not the ones looking for a value for money deal. Stay tuned for a full road test on our website as well as in our magazine.